How can I learn the names of the many Miku models? Where can I download new models? How do I know the name of my favorite MikuMikuDance models? Let’s Go Learn Hatsune Miku MODELS!! Have you ever experienced a moment when you met one particular Miku model and you wanted to download that model… only to realize that you had no idea of WHAT is the model’s name and HOW to get it? 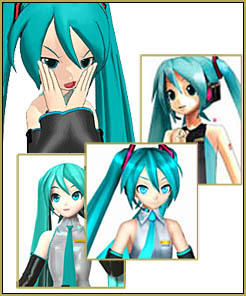 There are SO MANY Miku models, and we, as MMDers, know that very well. Downloading them is a pretty fun thing to do, but at times, it can also be problematic to find the exact Miku you want, considering the huge numbers of Miku models on the internet. Well, this is exactly what happened to me when I was making my second MMD video. Initially, I wanted to use the Mikus I already had but some of them just didn’t seem to fit into my video’s atmosphere. So, I went searching for more Miku models, and I found this video! As the title of the video suggests, this video is about the history of Hatsune Miku models… BUT the content of the video is far more than just a list of models! It showcases the creator’s name along with their models. Thus, it simplifies our work in terms of searching for the model that we want and crediting the creator. It covers MANY Miku models ranging from “normal” Miku models to totally bizarre ones. It explains the many minor details of each model and how to make full use of them. It even describes the model’s personality and how the MMD community judges each of them! And if you think that wasn’t enough… here’s more from nhinkptis, the creator of the video! She wanted so much to meet Miku Hatsune the Vocaloid, but somehow she strayed into MMD world and met —Watch how lovely Mariel copes. So, do check out nhinkptis‘s channel!! Besides the videos that I mentioned earlier, nhinkptis also has a lot of interesting posts in his/her channel, ranging from showcasing models, new and old, to jaw-dropping MMD animations. And you can be sure there is more to come from both nhinkptis and Miku!! Collection of links to the creator’s/HQ models for MMD. Various types of models from Vocaloid, UTAU, anime and etc. Useful rules and comments of nearly every model. …. I WANT NEW MODALS!